The best part about this costume is that, with the right vroom-vroom noises, it makes anything you're driving feel like a high performance stock car. And we do mean anything. Your shopping cart, that scooter gathering dust in your garage, the lawnmower, even the garbage cans you forgot to roll to the end of the driveway last night! You’ll get so addicted to the speed and rush of pretending to take the curves at the track that you’ll start rushing up escalators and the fast lane at the airport (right side for standing, left side for running!). Just pretend to rev that engine and no one will give you a second glance (j/k, they totally will)! 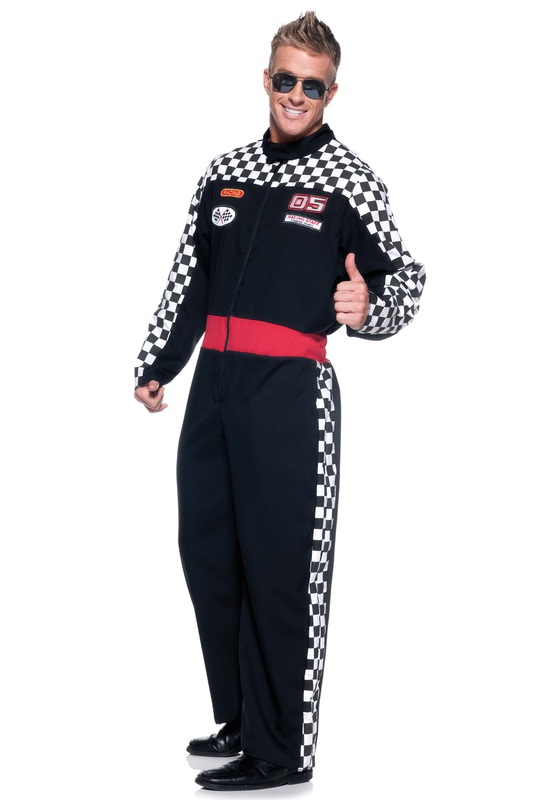 But in this Mens Plus Race Car Driver Costume, you won’t even care! It's designed to look like a real racing uniform, with actual patches sewn on the front. You'll feel so much like a pro driver, you might just spray champagne all over the house when you get home from the store, which we also don't recommend doing, but hey, it's your house, so you do what you want!